The New Art Gallery Walsall is the home of the distinguished Garman Ryan Collection, which was donated to the Borough in 1972 by Lady Kathleen Epstein (née Garman). "Two remarkable women created this collection: Kathleen Garman, lover and later wife of artist Jacob Epstein, and her life-long friend Sally Ryan, a talented sculptor." "Kathleen was originally from Wednesbury and, although had spent much of her life in London, wanted to give something back to the Black Country where she had grown up. She had formed this important collection with her close friend, Sally Ryan, granddaughter of an American tycoon and talented sculptor in her own right, following the death of Epstein in 1959." "Together, they formed an art collection that is intimate, adventurous and eclectic, reflecting their wide-ranging tastes." They "collected 365 important works, including those by renowned artists such as Van Gogh, Monet, Constable, Picasso, Degas and Matisse, as well as by friends and family members, such as Epstein, Matthew Smith, Theo Garman and Lucian Freud, alongside artefacts from many cultures around the world. Works are displayed in the thematic groupings proscribed by Kathleen on her donation, which allows the opportunity to make unexpected links and comparisons across different cultures and centuries." The Collection "consists of three hundred and sixty-five works of art, over a third of them being three-dimensional works from many different cultures and periods around the world. It also contains a wide-ranging body of the work of Sir Jacob Epstein and many significant works by European artists such as Van Gogh, Monet, Turner, Corot, Renoir and Constable represented in prints, sketches and drawings as well as paintings and sculptures." "The galleries chart the long, productive and often controversial career of Jacob Epstein, and serve as a memorial to the Epsteins extraordinary circle of family and friends - Augustus John, Modigliani, Gaudier-Brzeska and Epsteins one-time son-in-law Lucian Freud." "Jacob Epstein grew up in the ghettos of New York; his parents emigrated there to escape the anti-Semitism and poverty of Poland. As a young man, Epstein delighted in his vibrant, multi-cultural surroundings. His creative talents were evident early on, but his father disapproved of his chosen profession. In 1901, Epstein received his first commission to illustrate Hutchins Hapgood's Spirit of the Ghetto. The money he earned enabled him to study in Paris. The excitement that Epstein felt is reflected in his self-portrait: staring defiantly at the viewer, he presents himself as unconventional and rebellious. His hair is unkempt and his shirt unbuttoned, he appears dynamic and oozing with confidence. After only a few years in Paris, he relocated to England. Mixing with artists and intellectuals, Epstein soon integrated himself into the London art scene. After a brief association with the Vorticists - during which time he created his monumental Rock Drill (1915) - he remained independent of any movements. He caused a great deal of controversy throughout his career - his Tomb for Oscar Wilde (1912) caused such an outcry that the French authorities tried to have it banned. He was fascinated by so-called 'primitive art' from Africa, Asia and Oceania and collected many art objects, some of which are on display in the gallery. He was also a skilled portraitist and many busts and sketches can also be seen in the Garman Ryan galleries. The Garman Ryan Collection is a visual guide to Epstein's life, career and artistic interests." "Epstein was a man of intense feeling who did not hold back from injecting his passion into his religious works. Although ... much of Epstein's public had difficulty accepting the novelty of his work, some contemporaries did grasp the significant transformational potential of Epstein's art ... Epstein's original interpretations were recognized as bringing new life to a religious art that had become moribund." Additionally, the Garman Ryan Epstein Collection "contains over 100 art works by artists closely related to the Garman Ryan Collection, in particular works by Sir Jacob Epstein, which have been purchased, bequeathed or donated to The New Art Gallery Walsall." Throughout 2016 the Gallery will display some of the newest acquisitions to its Permanent Collection, in the lead up to its 125th anniversary next year. Part 1 looks at People and Artistic Connections. It premieres two works by Frank Auerbach which were the Gallery's first acquisitions through HM Government's Accepted in Lieu Scheme, and belonged to his great friend, Lucian Freud. They are also showcasing The Garman Ryan Shroud by Birmingham based artist Sarah Taylor Silverwood, the resulting commission following her residency in their Studio in 2014. The Garman Ryan Collection includes many parallels with works from Tate's extensive collections of British and European art and, as part of a three year partnership with Tate, 16 Tate artworks have been paired with related works in The Garman Ryan Collection, linked either by artist, subject or theme. Included are key examples of work by Eric Gill, Cedric Morris, John Nash, Picasso and Rodin. The Gallery is also hosting "the prestigious John Ruskin Prize, which is now in its third year as an open exhibition inviting artists, both emerging and established from across the UK, to respond to the theme, Recording Britain Now: Society." Jan Vanriet: The Music Boy - Much of Vanriet's work "is rooted in his family history. His parents met in the Mauthausen concentration camp and their stories and memories of the Second World War and its aftermath continues to influence his paintings. Themes of love, loss, identity, destiny and disappearance pervade his work. Yet there is also an inherent playfulness and lightness of touch and an evident mastery of the medium of paint. The Music Boy is a polyptych of four paintings depicting his grandmother and uncle - his mother's twin brother - playing accordion as a boy before the war." "Laura Lancaster is a painter who draws inspiration from forgotten and discarded photographs and home movies, found in flea markets, charity shops and through ebay. Once precious and significant to someone, they are now detached from their original contexts and instead, they become animated through Laura's luscious, gestural and expressive application of paint. These lost and dislocated souls, caught in the ambiguous space between figuration and abstraction, compel us to reflect on time, memory and loss." Compton Verney is an independent national art gallery and ‘Capability’ Brown landscape located nine miles from Stratford-upon-Avon. Its current exhibitions celebrate the 400th anniversary of Shakespeare's death. 'With the legendary actor-manager David Garrick serving as Shakespeare's high priest, bardolatry swept mid-18th-century England to the point that painters, too, reproduced the words and scenes that actors portrayed onstage. The artists' response on canvas, of course, was not entirely devotional. Prints of their paintings also earned them a pretty penny. 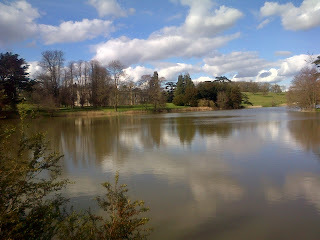 This is where Compton Verney's exhibitions begin. Boydell’s Vision: The Shakespeare Gallery in the 18th Century traces the history of John Boydell’s famous Shakespeare Gallery which opened in 1789 on London’s Pall Mall. The Shakespeare Gallery was the first thematic public exhibition of its time and also the first devoted to the Bard. Using Shakespeare as a vehicle for the development of a national school of history painting, the print publisher John Boydell commissioned prominent painters, sculptors and printmakers of the day, including George Romney, Henry Fuseli and James Northcote, to produce works depicting scenes from all of Shakespeare’s plays. Boydell’s Vision is the first exhibition in the UK to explore the formation of this early blockbuster, and includes paintings and prints by the artists commissioned by Boydell, as well as a recent digital reconstruction of The Shakespeare Gallery as it looked in 1796. 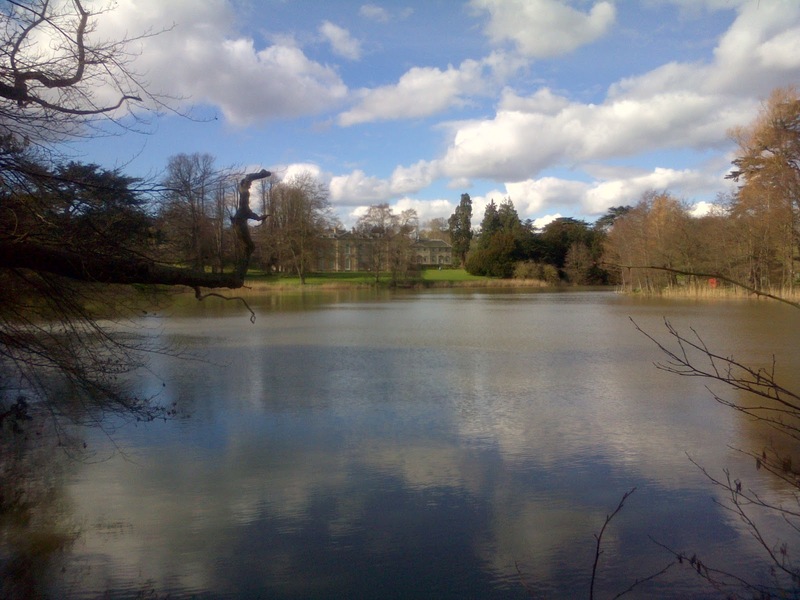 The example of Boydell's Shakespeare Gallery provides the inspiration for the theatrical design of Compton Verney's other Shakespeare exhibition. Shakespeare in Art: Tempests, Tyrants and Tragedy offers an opportunity for art and theatre lovers to discover his works through a unique series of theatrical encounters. These include paintings, photography, projection and a sound score and readings by leading Royal Shakespeare Company actors. Shakespeare was a master of dramatising human emotions in their myriad forms. His plays are as relevant to us today as they were over 400 years ago and they remain a vital source of inspiration to artists. This major new exhibition focuses on pivotal Shakespeare plays, including The Tempest, Hamlet, Macbeth and A Midsummer Night’s Dream, all of which have motivated artists across the ages, from George Romney, Henry Fuseli, Dante Gabriel Rossetti, John Singer Sargent and G.F. Watts to Karl Weschke, Kristin & Davy McGuire and Tom Hunter. Kate Tempest - What We Came After. A powerful bomb blast rocked Pakistan's eastern city of Lahore on Easter Sunday evening. The blast is believed to have killed over 60 people and to have injured over 200 local police have said. In Pakistan Christians have a long running tradition of celebrating as a family at local park fun fairs after their morning devotions. This practice has never been a secret and after the Lahore Twin Church bomb attack took a low death toll due to the tight voluntary security workforces at both churches, a pernicious Taliban splinter group targeted Christian women and children at a popular Easter venue at Gulshan-i-Iqbal Park. The bomb that was packed full of ball bearings was set of near the children's area with intent to pick off the most vulnerable of visitors to the park. A large number of families, especially women and children, were present when the blast took place Many of these are believed to be Christians as it is a common tradition for families to go to a local funfair to celebrate the birth of Christ after their Easter devotions. The British Pakistani Christian Association has initiated an immediate disaster recovery and calls for as much help as can as be given as number of fatalities and casualties are increasing by the hour. Donations will be used to support victims with funeral costs, medical fees, rehabilitation of those injured, trauma counselling and restoration of families who will have lost a main bread-winner or will be laid of work for some time. Details of how to donate can be found by clicking (here). The BCPA's petition can be signed here (click here). Casualties have been taken to local hospitals including Lahore General Hospital which does not have a special burns unit. 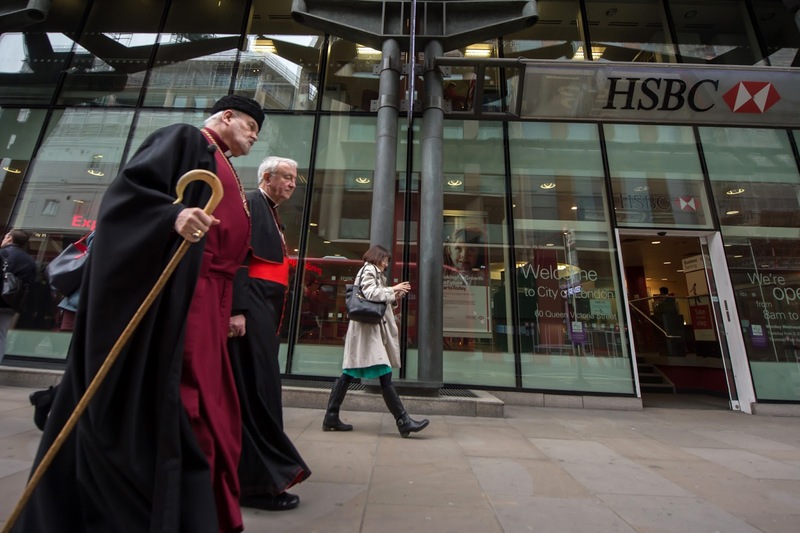 It is believed the attack took place during the celebrations of Easter in an attempt to target Christians. Distraught family members have gathered outside local hospitals and the government has announced a three day mourning period. Read full story (click here). Also see the BCPA's story on the BBC documentary 'Thailand's Asylum Crackdown,'. Chris Rogers has been undercover in Thailand to expose how the country treats its asylum seekers. Pakistani Christians fleeing extremist violence are among the second largest group of asylum seekers in Thailand. 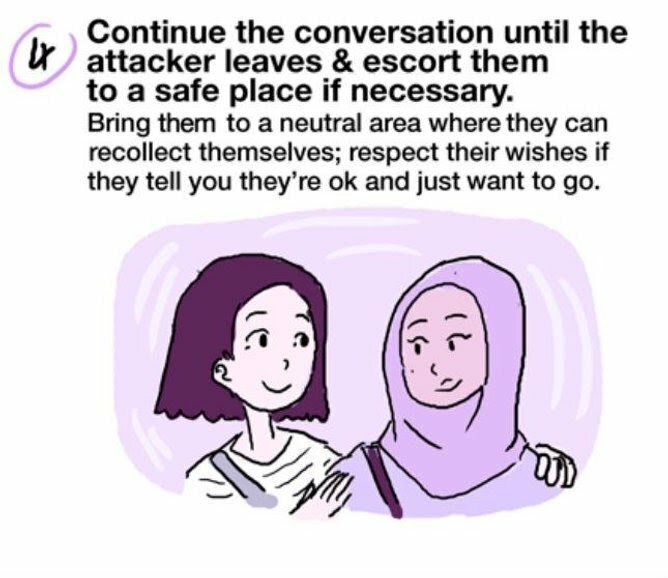 Many are routinely rounded up and sent indefinitely to immigration detention centres or locked up in jails. Their crime: to be seeking asylum, in a country which does not recognise refugees. Wilson Chowdhry Chairman of the British Pakistani Christian Association helped Chris Rogers, and organised direct contact with victims being helped by the BPCA. Read full story and watch video (click here). 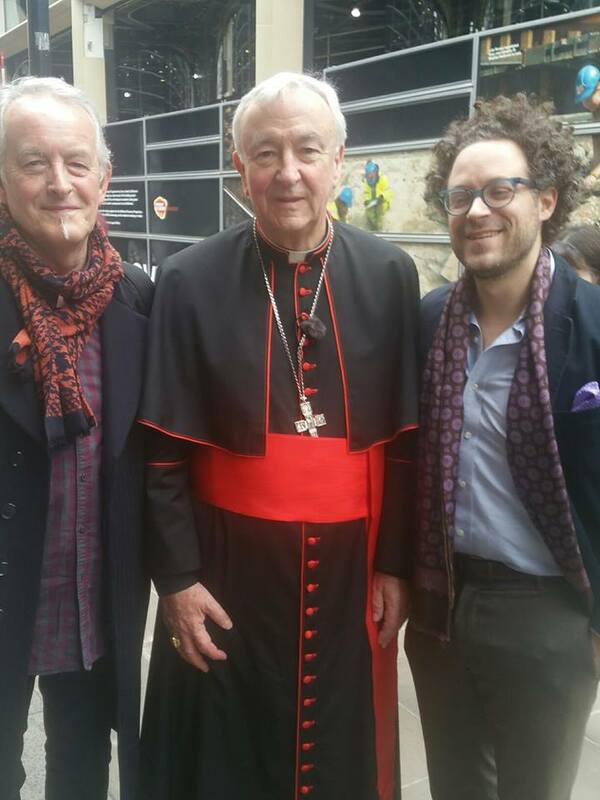 Ooberfuse ft Archbishop Warda of Iraq - We Are One. “Sherlock Holmes once remarked to Dr Watson that, ‘When you have eliminated the impossible, whatever remains, however improbable, must be the truth.’"
Muhammad is a good example. He died in his sixties after a very energetic life. His following had momentum -lots of people, good organisation, a buoyant mood. So it's no surprise to find that Muhammad's charisma gave rise to a great movement, known today as Islam. The single exception to the 'long life and growing movement' rule is Jesus. He died young - in his thirties. He spent only three years in the public eye and that in a small country under enemy occupation. He stayed local and didn't write anything down (apart from a word or two in the sand). Towards the end his popularity ran out and his followers ran away, their lofty dreams shattered. We are not speaking here of proof. Just as the existence or non-existence of God cannot be conclusively proved and is therefore, for both Christians and atheists, a matter of belief; so the resurrection cannot be conclusively proved or disproved and, on both sides, is ultimately a matter of belief. More than that, the Christian story of Jesus’ life, death and resurrection makes sense of life itself. 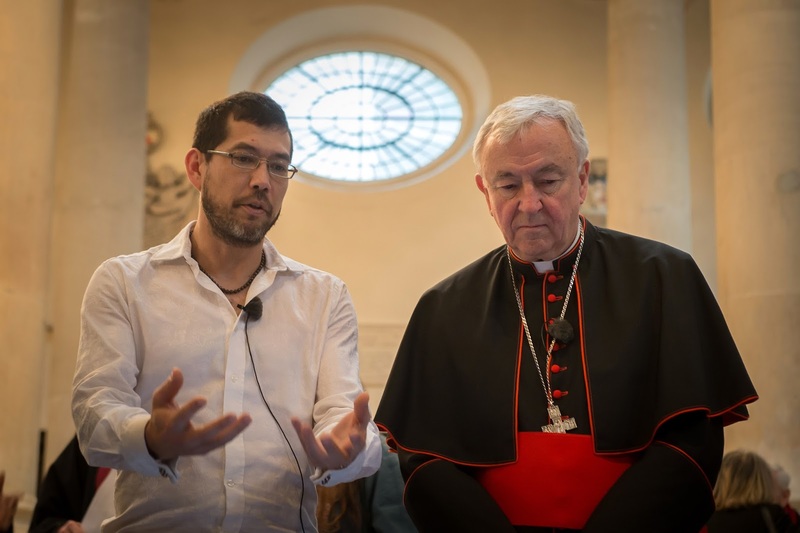 For the early Church and for Christians ever since, this story enables us to understand life, to make sense of it, to see it as a journey with meaning, purpose and an ultimate destination which is not death and destruction but new life and rebirth. Death AND resurrection. Suffering AND salvation. This is the journey which Christians make, following in the footsteps of Jesus, as we travel through Lent and Easter. While it is a journey which in no way minimises the reality and pain of suffering and bereavement, it is ultimately a journey of hope. One which leads to new life, where we proclaim that Jesus is alive and death is no longer the end. As a result, to go on this journey, builds resilience and endurance in those who travel this way. As we look at our lives, the difficulties and challenges we might face, our Christian faith tells us that this is not the end instead change and new life are possible; indeed, that they will come. The story of Christ’s death and resurrection takes us forward into a new life. The reality of his presence with us on the way helps us endure and persevere. The combination of the two brings hope for the future. Whatever we may experience in the here and now, ultimately Love wins. So, we have seen that belief in the resurrection not only makes sense of the rise of the Early Church but also can make sense of life itself, seeing it as a journey with meaning, purpose and an ultimate destination which is not death and destruction but new life and rebirth. This gives us a means of enduring the difficulties and challenges we face now with resilience and endurance because of our belief that this is not the end and that change and new life are possible and will come. As a result, the story of Christ’s death and resurrection takes us forward into a new life. The reality of his presence with us on the way helps us endure and persevere. The combination of the two brings hope for the future because whatever we may experience in the here and now, ultimately Love wins. That is what made sense to John Polkinghorne and C.S. Lewis and is also what has made sense for millions of Christians over the centuries since that first Easter Day. May we also know Christ’s resurrection not only making sense for us but also making sense of our lives too. Larry Norman - The Tune. 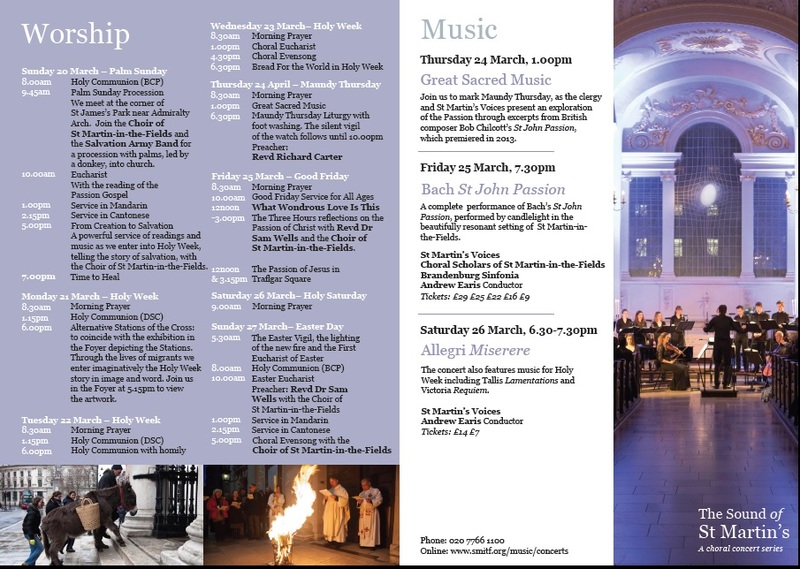 The Easter Vigil Service at St Stephen Walbrook is on Saturday 26 March at 6.00pm and includes the lighting of the Paschal Candle, renewal of Baptismal Vows and the first Eucharist of Easter. 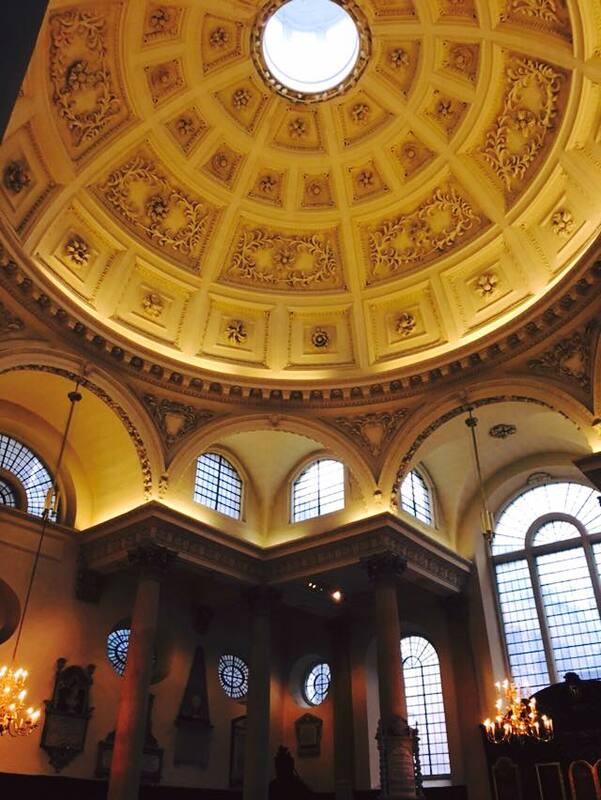 The setting, Mozart’s Mass in Bb, will be sung by the St Stephen Walbrook Choir with Joe Sentance on organ. The preacher will be The Revd Sally Muggeridge and the service will be followed by hot cross buns and drinks. All are most welcome. 'Lamentation for the Forsaken' by Michael Takeo Magruder can also be viewed. In this art installation, Takeo offers a lamentation not only for the forsaken Christ, but others who have felt his acute pain of abandonment. 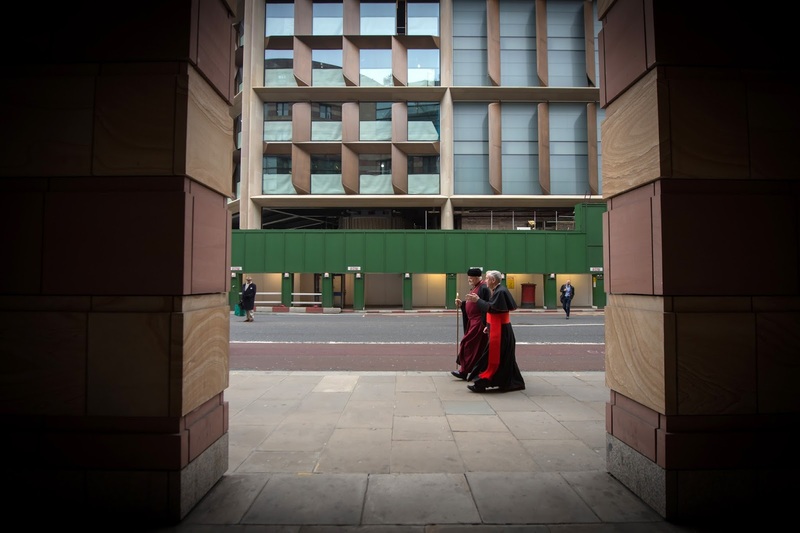 Click here to view Arriving at Station XIII, a short series of videos exploring the development of this newly commissioned artwork for the Stations of the Cross project. The videos follow Takeo's progress as he conceives, develops and finally presents his installation at St. Stephen. 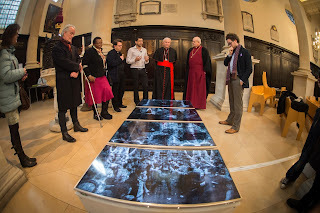 The installation was visited as part of a mini-pilgrimage undertaken by the Bishop of London and Archbishop of Westminster to three stations in the Stations of the Cross 2016 exhibition. Click here to see photographs from their visits to Salvation Army International Headquarters and St Giles Cripplegate and here to see videos of the visit to St Stephen and the other Stations. Wolfgang Amadeus Mozart - Missa Brevis in Bb. NIU Chamber Choir - Precious Lord Take My Hand. Great photographs from the Catholic Church of England and Wales of the St Stephen Walbrook leg of the mini-pilgrimage undertaken by the Bishop of London and Archbishop of Westminster to three stations in the Stations of the Cross 2016 exhibition. 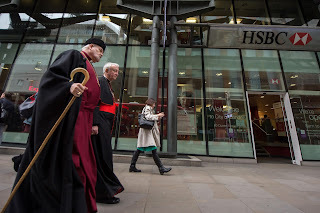 Click here to see photographs from their visits to Salvation Army International Headquarters and St Giles Cripplegate. At St Stephen Walbrook the Cardinal and Bishop viewed 'Lamentation for the Forsaken' by Michael Takeo Magruder speaking with the artist and praying the following prayer: Lord Jesus, enwrapped in death, upon the cloth that bound you was impressed your face, the face of the Son of the living God. Grant us the courage to seek your kingdom amidst the forsaken. Give us the grace to behold your suffering face upon those killed in conflict. May they rise to everlasting life with you who lives and reigns for ever and ever. Amen. 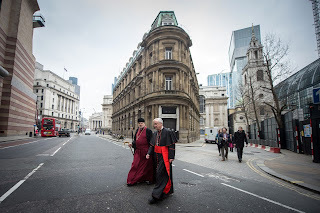 Click here to see videos of the visit to St Stephen and the other Stations. Thomas Dorsey - Take My Hand, Precious Lord. Jesus had a marvellous way of subverting people’s expectations. He did it when he called on the one without sin to cast the first stone. He did it when he rode into Jerusalem as a King but on a donkey, not a charger. And he did it in this story too; when he, their Master, served the disciples by washing their feet. He continually turned the expectations of the people around him upside down. It was normal for a servant to wash the feet of those who came to visit and there would have been nothing unusual in a disciple washing the feet of his rabbi. These things reinforced what people thought of as the normal, natural, hierarchical order of things where some were masters or teachers and where such people had the right to lord it over those who were slaves or disciples. Jesus’ action also echoes that of Mary who washed his feet with a precious ointment and dried his feet with her hair. So, in washing his disciples feet Jesus, as a Master, does not only take the place of a servant but also affirms and follows the example of a woman; again, a radical, destabilizing gesture within a patriarchal society. Jesus goes further still in his explanation of what he has done. 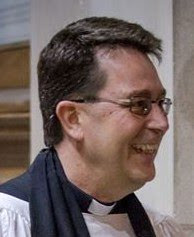 As Newbigin explains: “If Jesus had said: “Since I have washed your feet, you must wash my feet,” then we would have been fighting with one another for the privilege of being first with the basin and the towel. Then the old order of pre-eminence would have been restored, thinly disguised under the name of “service.” The “Chief Minister” would have become the old ruler under a new name.” But Jesus says something very different which negates that possibility. He actually says, “You ought to wash one another’s feet.” This is a statement that subverts and replaces all normal human patterns of authority. Imagine the task of drawing up a management chart in which A is subject to B, B is subject to A, C is subject to A and to B and A and B subject to C and so on. “Yet this is what is called for. The disciples are to be – literally – “servants of one another” (Gal 5. 13). This is about equality but it is not an equality based on human rights. Instead, this is an equality based on the fact of Jesus, our ‘Master’, making himself the slave of all of us equally. He laid down his life for us and out of love for all that he has done for we are to serve our neighbours. In other words, in order to serve others in this way we need to know who we are in Christ. We need to know that we are loved unconditionally by him, that we are accepted as we are and loved by him although we are still sinners. Each one of us goes through life looking for love but it is only when we know we are loved by God that we can relax in a love that is not going to change or to fail us. Having that security and confidence in our loves frees us to serve others in this radical way. It is what we see at the beginning of this story. Jesus knows that the Father has given him complete power; he knows that he has come from God and is returning to God. The security of this knowledge means that he can rise from the table, take off his outer garment, tie a towel around his waist and wash the feet of his disciples. The action flows directly from his sense that he is loved by God and is right in the centre of God’s will for his life. The sense of security that this provides means that does not have to worry what others think of him; nor does he worry about status and hierarchy. Instead, he is free to serve others, to love others, to give himself for others in the same way that his Father does. The reality is that Jesus had that knowledge and sense of security in God’s love throughout his ministry but it is in this story that the Gospel writer makes this plain to us, so we can grow into the same sense of security and through that gain the same ability to serve others. Peter protested at the thought of having his feet washed by Jesus not understanding that Jesus wanted to draw him into a deeper appreciation of God’s love for him. Today, like Peter, we too need to be drawn into that deeper awareness of God’s reaching out in love towards us. As we know and respond more deeply to that love tonight, Jesus challenges us to do what he has done for us; to wash the feet of others by sacrificing ourselves for others. Graham Kendrick - The Servant King. 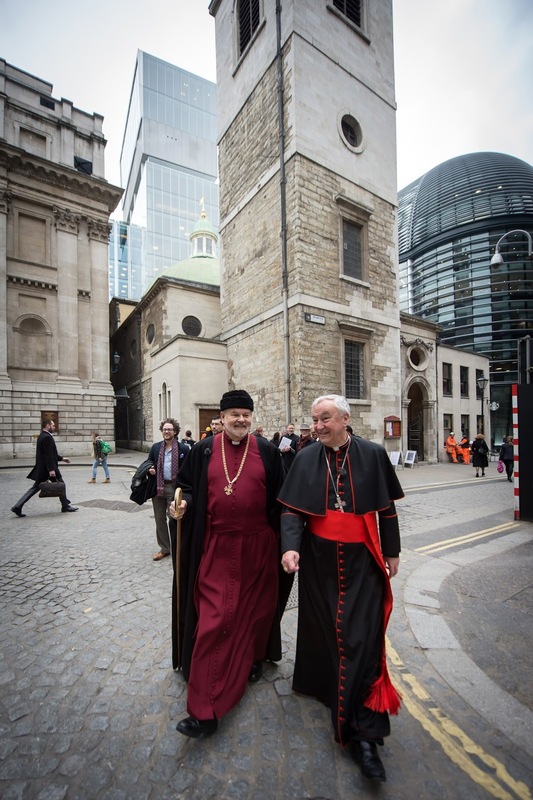 The Bishop of London and Cardinal Vincent Nichols undertook a mini-pilgrimage together today based on the Stations of the Cross 2016 exhibition, going from Salvation Army International Head Quarters to St Stephen Walbrook to St Giles Cripplegate. Lord Jesus, enwrapped in death, upon the cloth that bound you was impressed your face, the face of the Son of the living God. Grant us the courage to seek your kingdom amidst the forsaken. Give us the grace to behold your suffering face upon those killed in conflict. May they rise to everlasting life with you who lives and reigns for ever and ever. Amen. 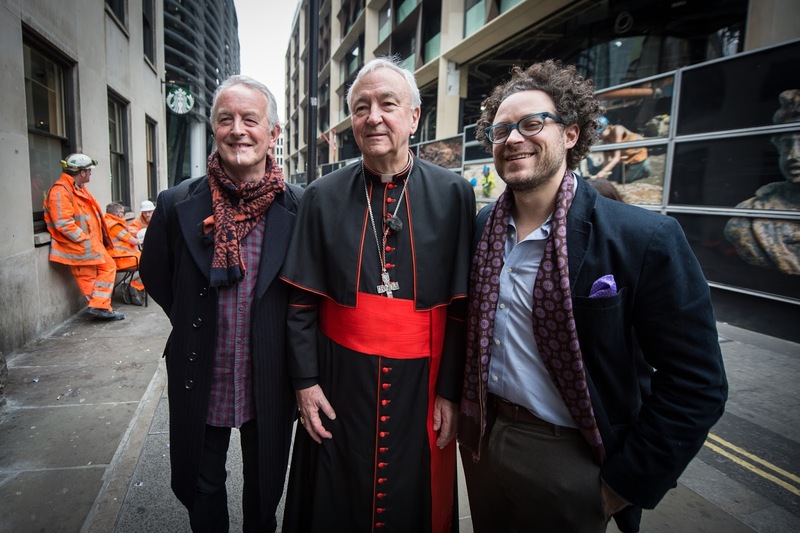 Cardinal Nichols spoke about seeing with the eyes of faith while Bishop Richard highlighted the importance of slowing down to reflect, something which this installation is achieving for busy City workers. 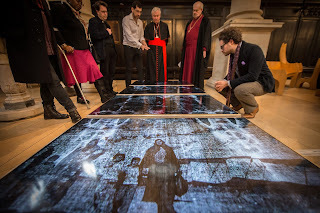 'Lamentation for the Forsaken' can be seen until Good Friday at St Stephen Walbrook (weekdays, 10am – 4pm, except on Wednesdays, 11.00am - 3.00pm), as part of ‘Stations of the Cross 2016’ an exhibition across 14 iconic locations in London during Lent. In his installation, Takeo offers a lamentation not only for the forsaken Christ, but others who have felt his acute pain of abandonment. Paradise - One Mind, Two Hearts. Jesus prayed on the night before he died but his disciples struggled to pray with him. It might seem difficult to know how to pray, but it may easier than you think. After all, Jesus simply spoke to God about the anguish he was feeling. We could think of praying as being a bit like Facebook: wherever you are you can check in to share your status, you can show you ‘like’ something, and you can share information about causes close to your heart. Prayers on the Move is a project, which you may have seen advertised on public transport networks around the country, that encourages people to give praying a go, or to try doing it more often, because praying helps develop our spirituality and enables us to connect with something bigger than ourselves. Jesus prayed while he was ‘on the move’; here he prays after the Last Supper and just before his arrest. You could also try praying ‘on the move’: when you see a homeless teenager on the street, or as you walk to meet a friend who’s just found out that his dad’s got cancer. In these prayers you’re responding to real situations in real time, and asking God to be a part of them. Once you’ve done this for a while, or if this approach doesn’t work for you, you may want to try to carve out a moment or two each day when you can take a deep breath and think and reflect on what’s going on, deep inside, at the edge of your consciousness. It doesn’t matter when this time is, but if it’s possible to make it roughly the same time each day, this will help you to get into a rhythm. · What has the past 24 hours been like – good or bad? · Was there anything stressful or upsetting? Did you handle it well? · Is there anyone you’ve let down? Did you let yourself down? · Is there anyone who needs help, either people you know or people in the news? · Is there anything, however small, to be grateful for? See http://prayersonthemove.com/ where you can find a prayer booklet and download a free ‘Prayers on the Move’ app, which includes one-minute audio files of prayers and allows you to set an alert to remind you to pray. Father God, teach me to pray not what I want, but what you want. Being remembered by you, serenity to accept what cannot be changed, courage to change what can be changed, hearing the still, small voice of truth, becoming rich in love. May all these blessings of almighty God, Father, Son and Holy Spirit, rest upon you and remain with you always. Amen. 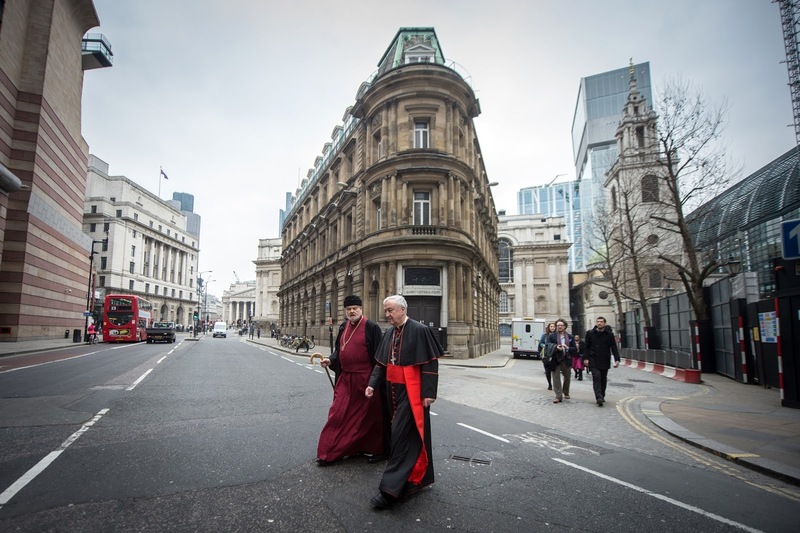 Prayers on the Move with Archbishop of Canterbury - How to Pray. 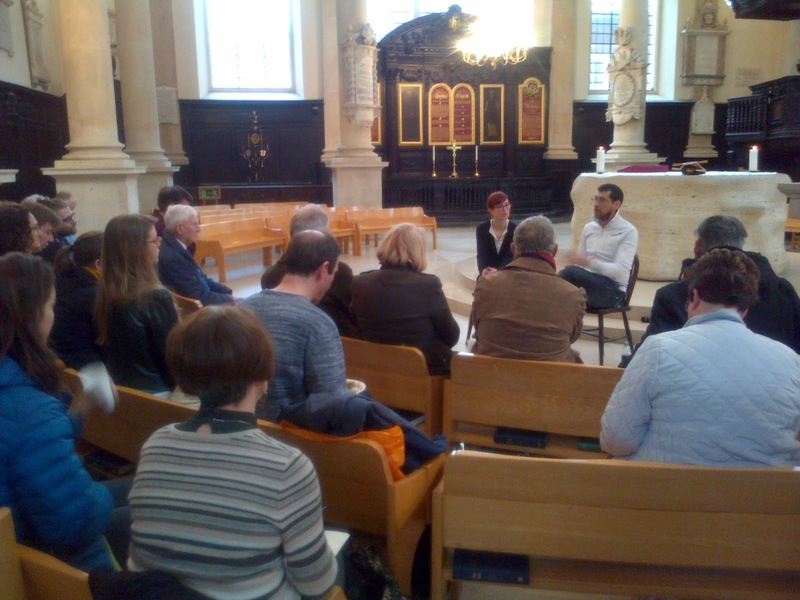 Yesterday we held a shared Discover & explore service at St Stephen Walbrook together with St Martin-in-the-Fields. The service was led by the Choral Scholars of St Martin-in-the-Fields, the Choir of St Stephen Walbrook and our organist Joe Sentance. The choirs sang the anthem which has given the themes for this Discover & explore service series; Eric Whitacre's 'Hope, Faith, Life, Love'. The theme of this service was 'Soul' and the preacher was Dr Carolyn Rosen. Following the service, the artist Michael Takeo Magruder discussed his digital art installation 'Lamentation for the Forsaken, 2016'. Carolyn Rosen began by introducing the readings and the concept of soul, and situating the ideas of death, life and eternity within the framework of Holy Week, as we live the story of Jesus' death and resurrection. She briefly explored the evangelists' accounts of Jesus' last words, final breath and resurrection appearances to show God, fully divine but also, crucially, fully human. She ended by highlighting several major breaths that run through our inheritance, our faith and our future to give us hope: God breathing into Adam, Jesus as the second Adam, Jesus' last breath on the cross and the resurrected Christ breathing the Holy Spirit onto his disciples. She offered the thought that we need both the Jesus if the cross and the resurrected Christ in our lives, as we encounter that same divine animating force in our fellows, whether they be refugees, those in need; and/or our neighbours, family and friends with whom we have longstanding relationships. 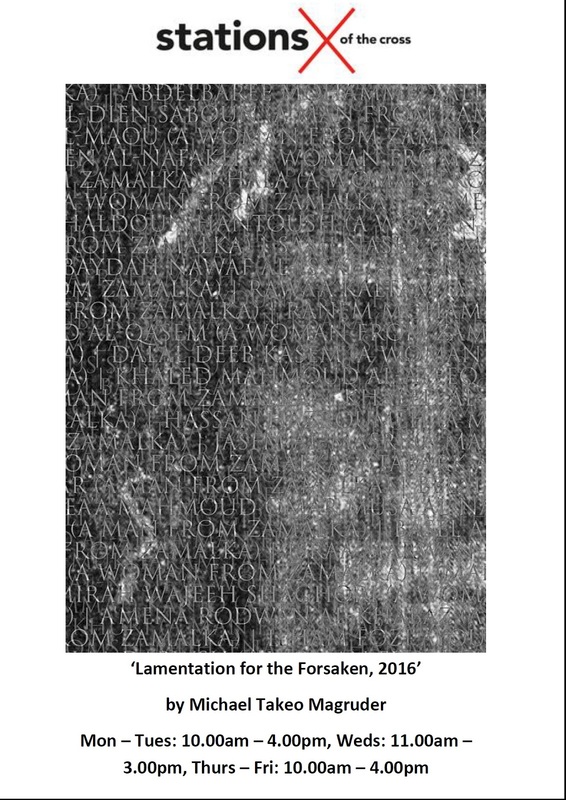 ‘Lamentation for the Forsaken’ reminds us that the real miracle is not the Turin Shroud but our capacity to look into the eyes of the forsaken—and see our Saviour. So, we pray … Lord Jesus, enwrapped in death, upon the cloth that bound you was impressed your face, the face of the Son of the living God. Grant us the courage to seek your kingdom amidst the forsaken. Give us the grace to behold your suffering face upon those killed in conflict. May they rise to everlasting life with you who lives and reigns for ever and ever. Lord, in your mercy, hear our prayer. 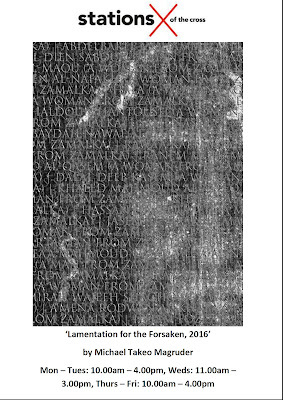 In ‘Lamentation for the Forsaken’ Michael Takeo Magruder offers a lamentation not only for the forsaken Christ, but others who have felt his acute pain of abandonment. So we pray … wilderness God, your Son was a displaced person in Bethlehem, a refugee in Egypt, and had nowhere to lay his head in Galilee. Bless all who have nowhere to lay their head today, who find themselves strangers on earth, pilgrims to they know not where, facing rejection, closed doors, suspicion and fear. Give them companions in their distress, hope in their wandering, and safe lodging at their journey’s end. And make us a people of grace, wisdom and hospitality, who know that our true identity is to be lost, until we find our eternal home in you. Through Christ our rejected yet risen Lord. Lord, in your mercy, hear our prayer. As we look at ‘Lamentation for the Forsaken’ in the place of Christ’s feet we see migrants in transit, in the place of Christ’s hands we find refugees caring for loved ones, in the place of Christ’s body we witness asylum seekers caught up in conflict. Christ’s face, meanwhile, yields place to a hollow-eyed young woman and a wide-eyed child dangling a limp doll. So we remember … Christ has no body but yours, No hands, no feet on earth but yours, Yours are the eyes with which he looks Compassion on this world, Yours are the feet with which he walks to do good, Yours are the hands, with which he blesses all the world. Yours are the hands, yours are the feet, Yours are the eyes, you are his body. Christ has no body now but yours, No hands, no feet on earth but yours, Yours are the eyes with which he looks compassion on this world. Christ has no body now on earth but yours. Lord, in your mercy, hear our prayer. The service led into discussion of the question - How can artists, congregations and clergy help the forsaken? Carolyn and Michael began this discussion before taking questions and comments from those present. 'Lamentation for the Forsaken' can be seen until Good Friday at St Stephen Walbrook (weekdays, 10am – 4pm, except on Wednesdays, 11.00am - 3.00pm), as part of ‘Stations of the Cross 2016’ an exhibition across 14 iconic locations in London during Lent. In his installation, Takeo offers a lamentation not only for the forsaken Christ, but others who have felt his acute pain of abandonment. 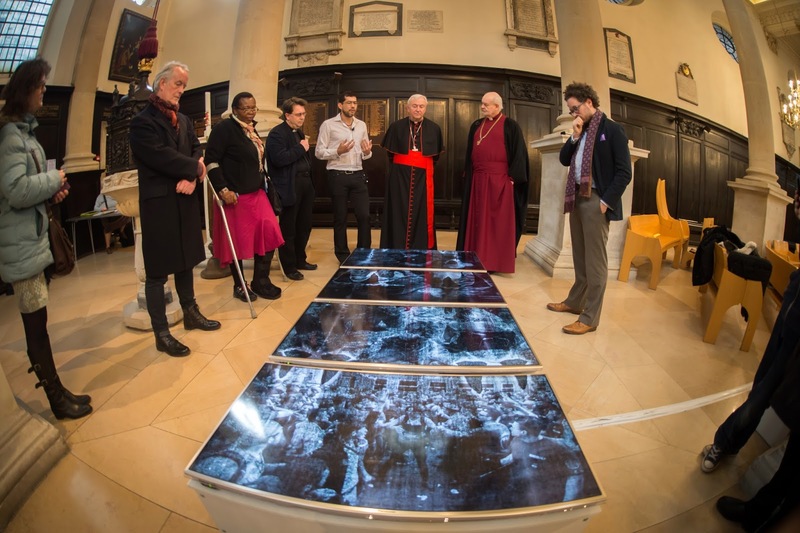 Click here to view Arriving at Station XIII, a short series of videos exploring the development of this newly commissioned artwork for the Stations of the Cross project. The videos follow Takeo's progress as he conceives, develops and finally presents his installation at St. Stephen. The Voices of East Harlem - Giving Love. 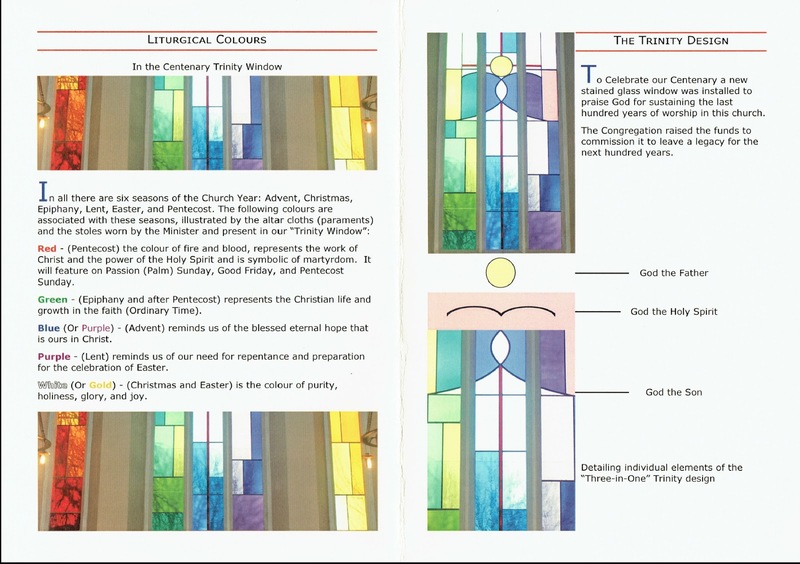 A service to commission and dedicate the newly installed “Trinity Window” as the East Window of All Saints Goodmayes, to commemorate a century of worship at the church, was held today. 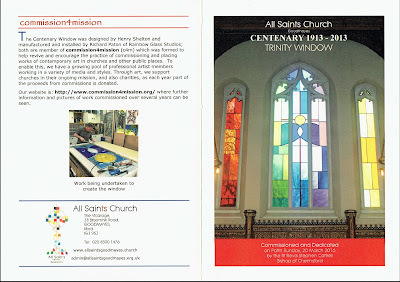 The Rt Revd Stephen Cottrell, the Bishop of Chelmsford, conducted the Service and dedicated the Centenary window. 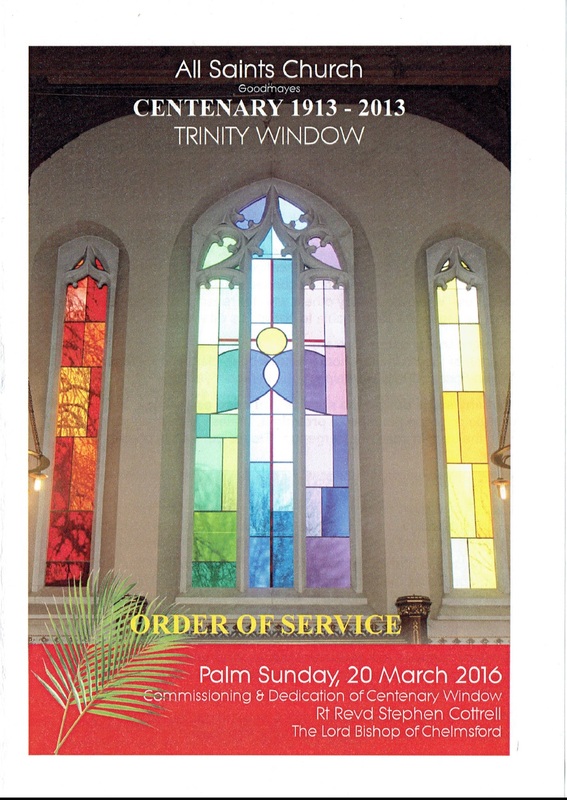 Bishop Stephen said that it was lovely to be at All Saints Goodmayes for Palm Sunday and to dedicate their beautiful centenary window. He noted that the window encompasses all the colours of the liturgical seasons and reminds of God the Holy Trinity. He spoke of God's promise to open the window of heaven for us and led the congregation in praying that as the light shines through the many colours of the window, so our lives may show forth the beauty of God's manifold gifts of grace. Bishop Stephen is a patron of commission4mission and the Trinity window at All Saints Goodmayes is the 13th commission completed by the group. The window was made and installed by Richard Paton to a design by Henry Shelton. Richard and Henry have previously worked together on commission4mission commissions at All Saints Hutton where they created two sets of etched glass windows. Tim Hughes - Here I Am To Worship. 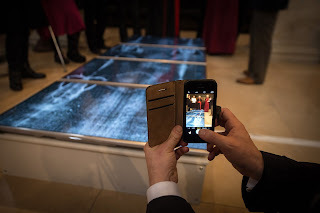 My latest Church of the Month report for ArtWay focuses on Coventry Cathedral. This Church of the Month report follows on from others about Aylesford Priory, Canterbury Cathedral, Chapel of St. Thérèse of the Child Jesus and the Holy Face, Hem, Chelmsford Cathedral, Église de Saint-Paul à Grange-Canal, Lumen, Notre Dame du Léman, Notre-Dame de Toute Grâce, Plateau d’Assy,Romont, Sint Martinuskerk Latem, St Aidan of Lindisfarne, St Alban Romford, St. Andrew Bobola Polish RC Church and St Mary the Virgin, Downe, and St Paul Goodmayes, as well as earlier reports of visits to sites associated with Marian Bohusz-Szyszko, Marc Chagall, Jean Cocteau, Antoni Gaudi and Henri Matisse. Eric Bibb - Don't Ever Let Nobody Drag Your Spirit Down. A corporate grant award from the London Borough of Redbridge enabled Sophia Hubs Limited to gain an additional £20,000.00 for Sophia Hub Redbridge through successful applications to the Diocese of Chelmsford Mission Opportunities Fund and Awards for All. 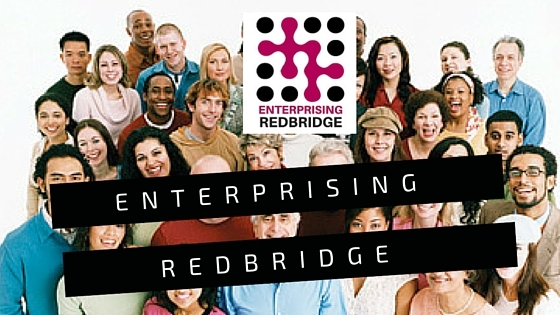 youtube videos prepared and posted publicising Timebank and Sophia Hub Redbridge. We also enabled the contribution of 1,338 volunteer hours during 2015 and the exchange of 358 hours through the Timebank from April 2015 to March 2016. Click here to see our 2014/2015 achievements and here to see our 2013/2014 achievements. Curtis Mayfield - A New World Order. Resurrection, as imaged in these songs, is about being freed from the bounds of our own frustrations which numb our senses. As we are brought to life, we come alive to the colours of the Spring with hearts which are open so we do not miss a thing. This is an understanding of resurrection in which we can all potentially participate. when I see a hesitant smile form on the face of the Big Issue seller. when I hear a friend’s story of depression and unanswered pleading. when I see a husband answer again the question from his alzheimered wife. when the Metro contrasts Big Mac obesity lawsuits with African famine victims. when I see Sutherland’s Crucifixion and read Endo’s Silence. when I remember the aircraft shattered and scattered across Kosovan heights. the beautiful or broken, the passionate or poor. 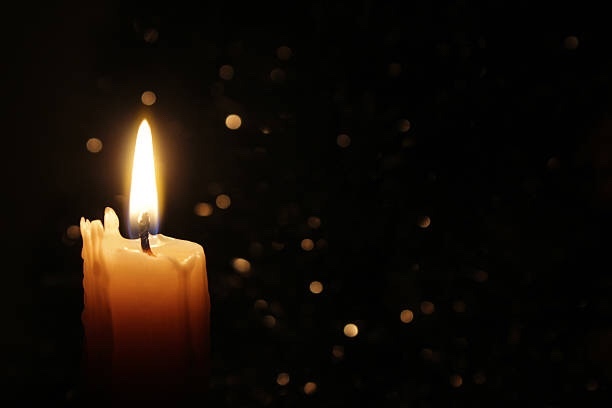 Let us pray … Lord Jesus, we are frozen inside without your touch, without your love. You are the life among the dead, so wake us up inside. Call our names and save us from the dark. Bid our blood to run before we come undone, save us from the nothing we’ve become. Bring us to life. Amen. 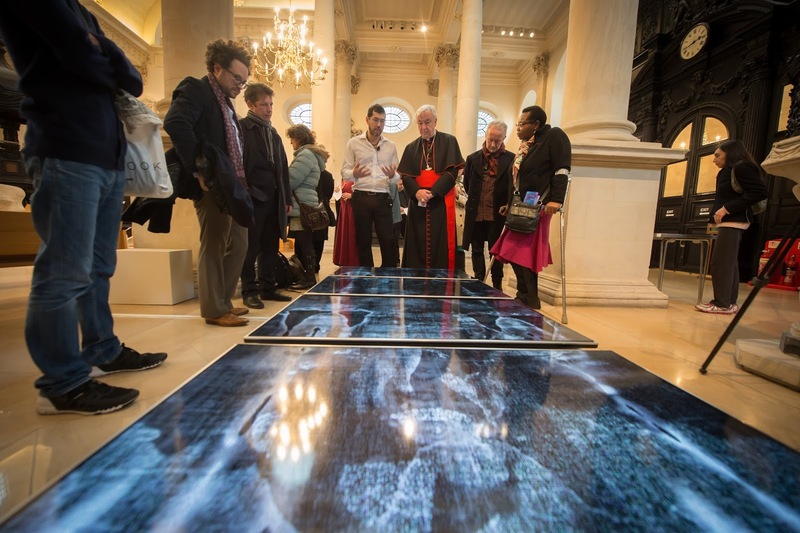 The Stations is an artistic project reflecting on the Stations of the Cross and the suffering of Jesus through images and stories of today's refugees. The Stations is a photographic exhibition in the Foyer of St Martin-in-the-Fields until Sunday 10 April 2016. The traditional ‘stations of the cross’ are a series of 14 images depicting the stages of Christ’s journey on Good Friday. This unique photographic study by creative director Marksteen Adamson, in collaboration with Premier Christianity magazine, is a parallel journey retold through the lives and stories of the refugees he met and befriended in Calais, Lebanon and the UK. 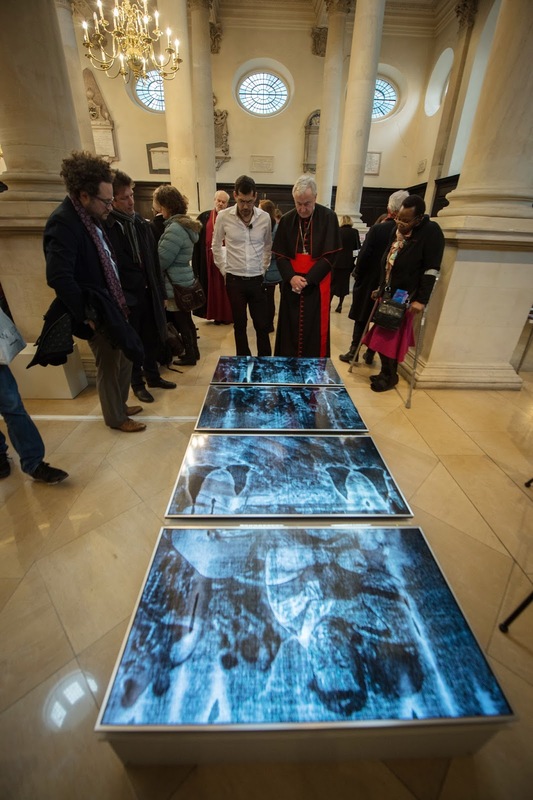 Adamson reinterprets these stages of Jesus’ own experience of suffering and persecution as seen through the lives and stories of the refugees Adamson has met and become friends with during trips to Calais, Lebanon and within the UK. This powerful exhibition seeks to reinterpret an ancient series of images that have spoken for centuries to those who have themselves experienced suffering. Christ’s journey of pain and sacrifice is a universal one played out in the suffering of people from different faith backgrounds and captured in stark and arresting ways through the stories of a modern humanitarian crisis. Martin Smith, Cece Winans & Lakewood Choir - Fill My Cup. 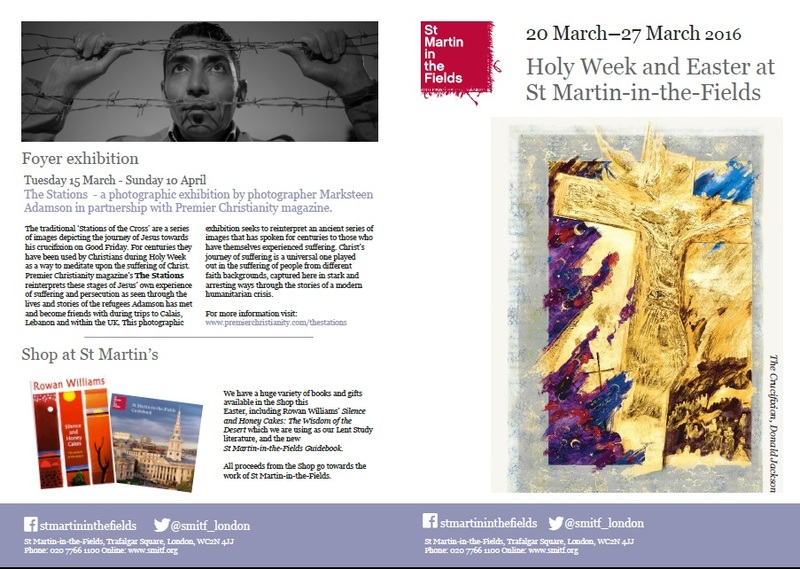 At St Stephen Walbrook, Holy Week begins with a shared service with St Martin-in-the-Fields - Monday 21st March, 1.10pm. This will be a Discover & explore service with the Choral Scholars of St Martin-in-the-Fields, the Choir of St Stephen Walbrook and our organist Joe Sentance. The choirs will sing the anthem which has given the themes for this Discover & explore service series; Eric Whitacre's 'Hope, Faith, Life, Love'. The theme of this service will be 'Soul' and the preacher will be Dr Carolyn Rosen. Following the service, the artist Michael Takeo Magruder will discuss his digital art installation . 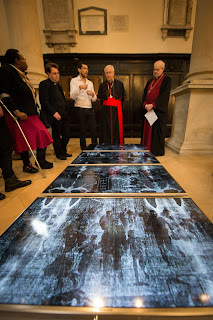 'Lamentation for the Forsaken, 2016' can be seen until Good Friday at St Stephen Walbrook (weekdays, 10am – 4pm, except on Wednesdays, 11.00am - 3.00pm), as part of ‘Stations of the Cross 2016’ an exhibition across 14 iconic locations in London during Lent. In his installation, Takeo offers a lamentation not only for the forsaken Christ, but others who have felt his acute pain of abandonment. 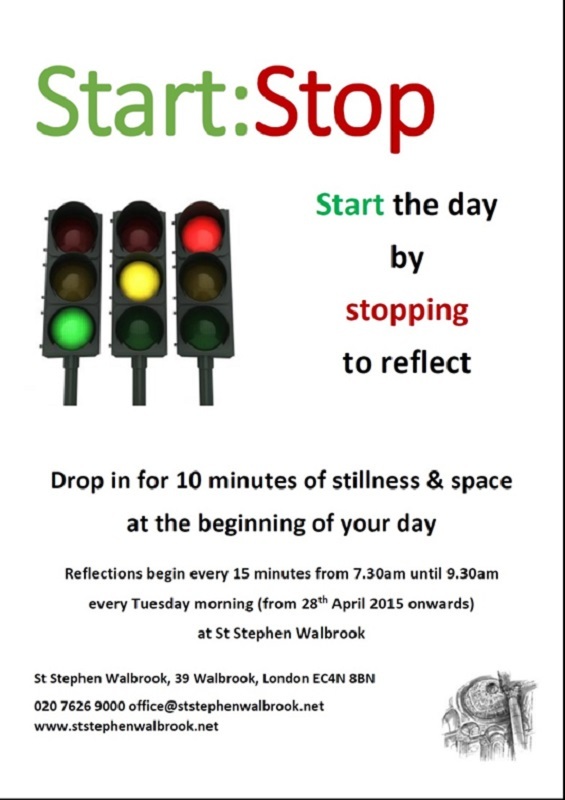 On Tuesday 22nd our Start:Stop reflections (10 minutes of quiet reflection on a drop-in basis) between 7.30am and 9.30am will be on the theme of Holy Week. Our Tuesday chamber music recital at 1.00pm (organised by the Walbrook Music Trust) will be given by Maria Zachariodou (piano and cello). 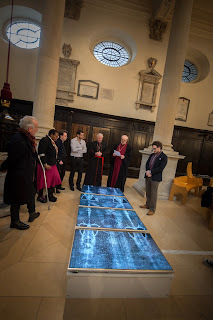 Our Maundy Thursday Eucharist is at 12.45pm where the Choir of St Stephen Walbrook will sing Byrd's Mass for four voices and Victoria's Vere languores. 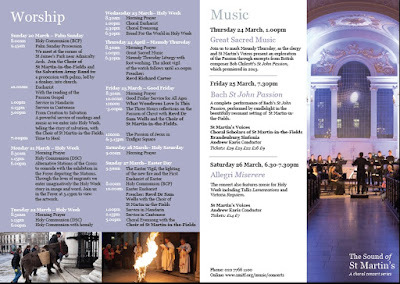 Our Easter Eve Vigil Service, which includes renewal of baptismal vows, the lighting of the Paschal Candle and the first Mass of Easter, will be on Saturday 26th March at 6.00pm when the Mass setting used by the Choir of St Stephen Walbrook will be Mozart's Mass in Bb. W. A. Mozart - Missa brevis in B flat major. 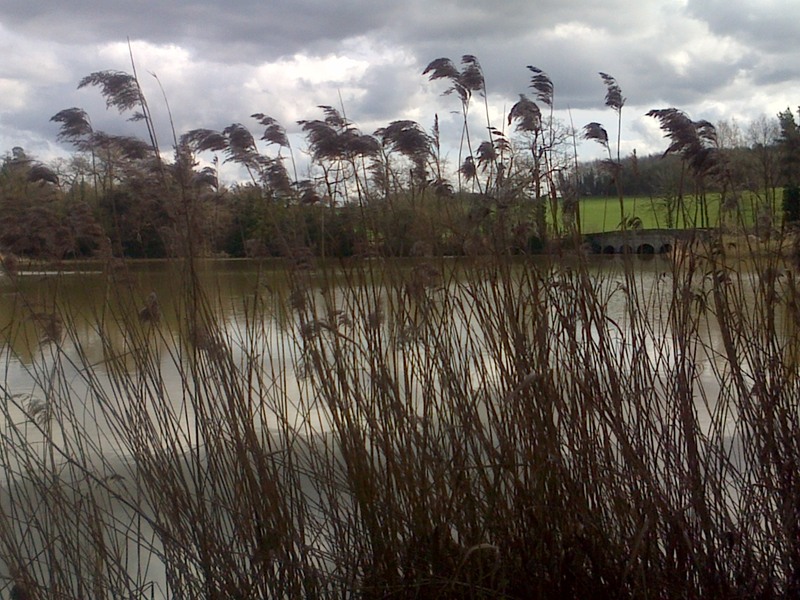 In today's Observer Aaron Rosen chooses his 10 best places for reflection. From Reykjavik to Tate Modern, he looks at spaces to inspire contemplation during Lent. Brian Clarke says that stained glass ‘can transform the way you feel when you enter abuilding in a way that nothing else can!’ I would concur, especially after arriving at l’Abbaye de la Fille Dieu in time for a memorable service of Vespers followed by silent contemplation in the still onset of darkness falling.Tomas Mikulas, the architect on the restoration of this Cistercian Abbey, has stated that the overall goal of the restoration was to offer both nuns and visitors an ‘atmosphere conducive to meditation and prayer.’ Mikulas suggests that it is the ‘warm and vibrant atmosphere’ created by Clarke’s windows ‘with the changing light of day’ that ‘makes a decisive contribution’ to the space and to the restoration as a whole. Alfred Manessier was a lyrical abstractionist who thought of stained glass less as a design than as “the simultaneous creation of a light-filled architectural unit, thought-out and created by the painter at one go.” In this way he wanted "to express man’s inner prayer.” Chapelle Sainte-Thérèse-de-l'Enfant-Jésus et de laSainte-Face in Hem is an attempt to create spiritual space - a sense of prayer and a glimpse of heaven – through the play of light and colour within the building. Pleshey was the first Diocesan Retreat House to be established in the country. Amongst the list of Retreat conductors is Evelyn Underhill. Arguably the most distinguished Conductor of that time, it is largely due to Underhill that the Retreat house became so popular. When you come to the Retreat House in Pleshey you sense an atmosphere created by six hundred years of prayer. For me, it is a special place because of ordination and cell group retreats. of prayer and praise / to tease and to please / the senses of God. Adam Kossowski's murals at St Benet's Chapel fill the entire wallspace of this circular chapel surrounding and enveloping worshippers with their imagery. When services are held, however, the altar table is located in front of the panel depicting worship in heaven of the lamb that was slain. In this way, worship on earth is conducted in the context of worship in heaven. This work is about rescue, redemption and salvation. Fr. Edward Maguire has written, 'From clay and fire he forged a vision of the past, present and future to lift up and inspire countless others ... May we be inspired by him to use our gifts as he used his." Lourtier is to be found among the imposing alpine architecture of snow-capped peaks in the Val de Bagnes, one of Switzerland's largest nature reserves. I arrived at the end of the afternoon to find the mountain sunshine flooding the empty church. Alberto Sartoris’ design for Notre-Dame du Bon Conseil is clean, spare and minimalist. Internally, the church is a simple white rectangle with a sleek arched wooden roof. Both the ceiling’s planks and the grey-painted wooden pews draw the eye to the sanctuary wall containing two large stained glass windows by Albert Gaeng. The triumph of Lourtier is an influential design coupled with a dramatically beautiful building that is well suited to the liturgy and well used by its people. 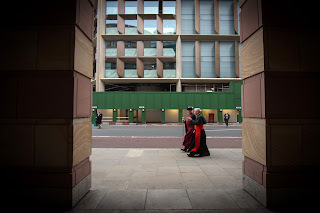 On entering the rooms of the Message Biblique - first the room of Genesis and Exodus, then the Song of Songs - one is struck by the colours of the works before their content. Chagall viewed painting as the reflection of his inner self and therefore colour contained his character and message. In his museum inauguration speech he said, ‘If all life moves inevitably towards its end, then we must, during our own, colour it with our colours of love and hope.’ These are paintings which seek to dream by their colours and lines an ideal of fraternity and love. To be surrounded by these massive statements demonstrating - through content and construction - the potential of religion for reconciliation, was a wonderful and moving experience. 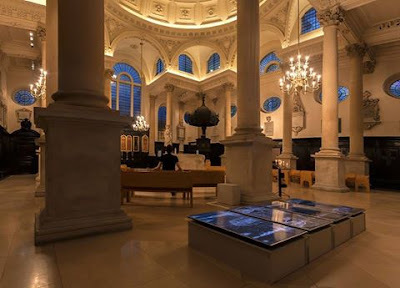 A stunning blend of old and new art and architecture is to be found at St Stephen Walbrook, Sir Christopher Wren’s masterpiece. Bombed in the Second World War and restored to its present magnificent state in 1981, twentieth century artists and craftsmen have adorned its interior. Henry Moore’s travertine marble altar now stands at the centre under Wren’s dome surrounded by dazzling kneelers from Patrick Heron. Moore’s altar design was intended for people to gather as a community around the altar where God could be found at the centre. 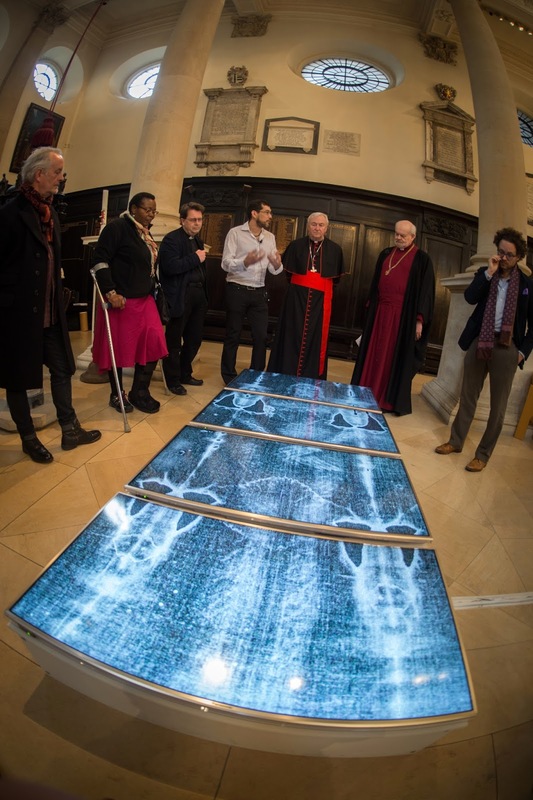 Currently contemplation is aided by 'Lamentation for the Forsaken, 2016’, a digital art installation by Michael Takeo Magruder which evokes the memory of Syrians who have passed away in the present conflict by weaving their names and images into a contemporary Shroud of Turin. What would your 10 choices be? Lavine Hudson - Flesh Of My Flesh.